Biopolymers are intended to substitute the petroleum-based polymers and all-cellulose composite has emerged as a green alternative, especially if it can be prepared through a method consuming less energy and fewer chemicals. Here, a novel approach to obtain a nanocomposite film made of cellulose fibrils imbibed into a nanocellulose matrix is described. Banana pseudostem was used as raw material and characterized along with the resulting materials using scanning electron microscopy, optical microscopy and Raman spectroscopy, while the cellulose/nanocellulose film was studied through X-ray diffraction, UV–Vis-NIR spectroscopy and laser scanning microscopy. 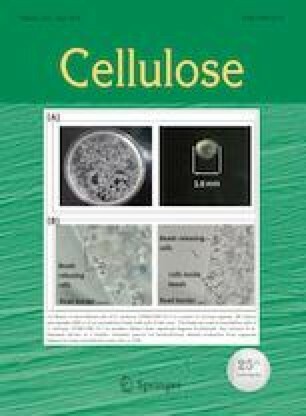 Results indicate that cellulose (fibrils) and nanocellulose (platelets), extracted from banana pseudostem were successfully purified using hydrolysis at a relatively low amount of chemicals. Transparent films made of a fibrils/nanoplatelets blend were prepared by the solution casting method, exhibiting a transmittance of ≈ 83–88% and a crystallinity index of ≈ 70, hence demonstrating the feasibility of this novel method to obtain cellulose/nanocellulose free-standing films.